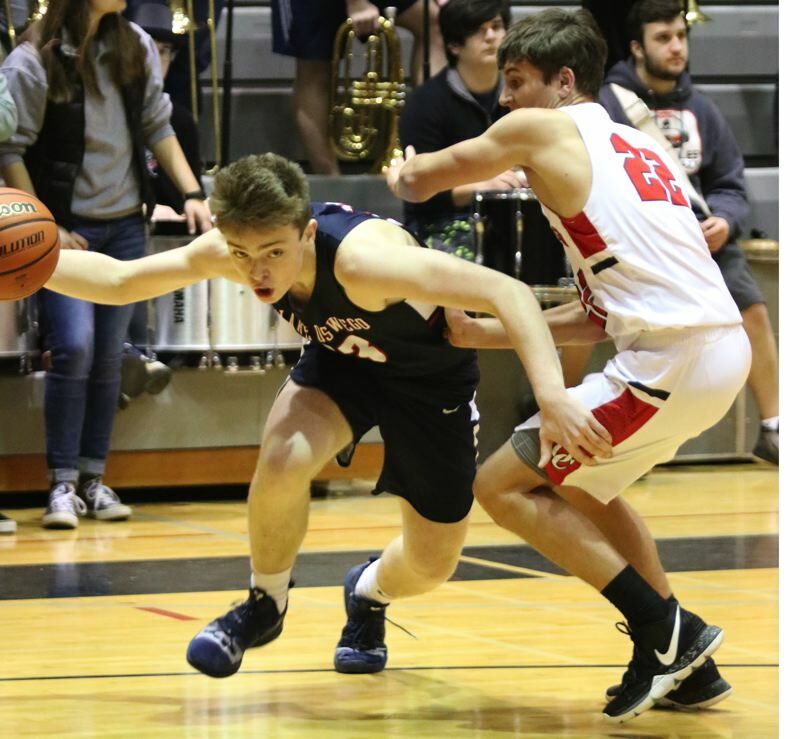 The Lake Oswego Lakers marched into Oregon City High School's gymnasium on Friday night and ran around as if they owned the place. Lake Oswego senior Josh Angle had the hot hand early, scoring 15 of his game-high 20 points in the first half to help carry the No. 3-ranked Lakers to a 60-46 victory over the Pioneers. Sophomore Wayne McKinney finished with 13 points for the Lakers (10-3, 2-0 TRL), who went on a 16-8 run in the closing 5:27 of the second quarter to take a 34-19 halftime lead and never looked back. Oregon City cut the deficit to five points, 36-31, with 4:46 to play in the third quarter, but the comeback bid faded behind a rash of missed 3-pointers and turnovers as the Pioneers (9-4, 0-1) lost for only the second time in eight games. "Oregon City is a good, all-around team," said Angle, the Lakers' 6-foot-3 shooting guard. "They don't have any weaknesses, they're very well-coached, and they execute their stuff well, so we knew that they weren't going to lose the game. We were going to have to come in and win it." The Lakers' game plan was to do what they do best, combining a fast-paced, up-tempo offense with some physical, high-pressure defense. It worked pretty well in the first quarter, especially at the defensive end as the Lake Oswego held the Pioneers to six points on 3-for-9 shooting from the field with six turnovers and the Lakers jumped out to a 14-6 lead. After Oregon City's Andre Best hit a 3-pointer from the right wing to cut Lake Oswego's lead to 18-11 with 6:05 to play in the second quarter, the game briefly morphed into The Josh Angle Show. In a span of two minutes, Angle reeled off 10 straight points on a 3-pointer from the right wing, a breakaway lay-up off an Oregon City turnover, a basket off an offensive rebound, and another 3-pointer from the top of the arc that made it 28-11 with 3:50 to play in the half. "My teammates were setting great screens and allowing me some open looks," Angle said. "When they get me open like that, I owe it to them to knock it down. "You always want the ball in situations like that. At the same time, the shots have to come I the flow of our offense, because every shot that we take is 'our' shot, it's not just my shot." Trailing 34-19, the Pioneers opened the second half with a 12-2 run, giving their fans some hope when Jake Gettel buried a 3-pointer that pulled OC within 36-31 with 4:46 left in the third quarter. Lake Oswego outscored the Pioneers 6-4 over the final 2:48 of the third quarter and then got another big 3-pointer from Angle -- his fourth of the game -- to open the fourth quarter and extend the Lakers' lead to 45-35. Oregon City never got any closer than seven points after that. "We pride ourselves on once we get a lead, we hold onto it and we execute our stuff," Angle said. "So getting a lead from the get-go was very important and then I felt like we were able to hold it down the stretch by just playing our game." Gettel was the only Oregon City starter to score in double figures with 10 points, while Dalton Welch added 10 points off the Pioneers bench and Best finished with nine. "I think it was just the first half that got us," said Remsberg, who was held to four points before fouling out with 1:48 to play. "Lake Oswego came out with more energy than we did and they seemed like they were ready to go. We just weren't mentally ready to be pushed around like we were. "We know we can hang with them, if you look at the third quarter. Like, we can hang with anybody. We just have to come play our game and play hard for all four quarters, and we didn't do that tonight." Oregon City coach Aaron Newkirk said his team's most glaring breakdowns were with transition defense and in the rebounding department -- two areas that had been strengths throughout the non-conference schedule. "We just weren't very good in those two area and Lake Oswego was exceptional in both and they just gave it to us," Newkirk said. "They were more physical than we were, they were more determined, and it's too bad to let that opportunity slip away, because I do think that we're better than what we showed." It didn't help when Gettel and Remsberg each picked up two fouls each in the first six minutes of the game, throwing a monkey wrench into the Pioneers' normal rotation. "You're up against it when some of the players you depend on to score get into foul trouble," Newkirk said. "They kind of get knocked off their game a little bit, but I think what the film will show in the first quarter was that we had a lot of opportunities and a lot of wide-open shots. "We got behind and Lake Oswego is not a team that you want to play from behind against. … The kids responded well, but when you're down 15 at halftime, you almost have to be perfect for 16 minutes. You're trying to make up a point a minute and it's very difficult in a high school game because the game's over so quickly." Lake Oswego coach Marshall Cho praised the Lakers for their strong start as well as their strong finish. "For us to have a double-digit win in a tough place like this, I'm very pleased," Cho said. "I thought our tempo was really good in the first half. We do like to mix it up where we like to press, whether we're going full court or half court, and I thought we did a really good job of pushing the pace. "Then in the second half, we weren't as mentally sharp as we needed to be in a place like this. A good, well-coached team like Oregon City is not going to fold at home. They came and they showed their grit, and then I thought we showed a lot of character, holding them off the way we did." Oregon City returns home Tuesday for a 5:45 p.m. game against Canby (6-7, 1-1), while Lake Oswego travels to cross-town rival Lakeridge on Wednesday for a 7:15 p.m. game with the Pacers (6-7, 0-2). Lake Oswego (60) -- Josh Angle 20, McKinney 13, Roberts 2, Abere 8, Harding 9, Senf 2, Fuson 4, Woolf 2, Graver. Oregon City (46) -- Jake Gettel 10, Dalton Welch 10, Remsberg 4, Best 9, Talley 5, Nova 8, Bergren, Hanson.